According to their website, Infinity is selling off the last of their 10'x27" New Deals. The price of $1317 and free shipping has my attention. I can handle the length and 122L volume, but I'm nervous about the width. Anybody about 200lbs out there riding boards less than 28 inches in width? Re: Infinity New Deal 10x27"
Whats the narrowest board you are currently on? how do you feel on it? Length helps stability a bit. I'm 6'5" and 235-ish and if I had the money and the storage space, I would buy one in a heartbeat. I ride boards between 29-27.25 in width. If aren't comfortable on a 29 inch board, 27 might be a step too far. Email them directly. When I did, Dave Boehne (the shaper) emailed me right back. I'm sure he will give you some good advice. Yeah, I actually called Infinity last week. As soon as I asked about SUPS I was put on hold and Dave Boehne picked up to answer my questions. I kept my cool. But I was a little starstruck. 28' is the narrowest board I've tried. Seems doable in perfect conditions. I went ahead and ordered one (think I might have gotten the last New Deal as it now says "sold out"). I'm a little worried about the 27" width. I'm an intermediate surfer but do a lot of paddling on a 23" Whiplash with no problems. My current board is a Fanatic Allwave 7'11"x31" (110L) so it will be a big drop in width but I want to try something longer and skinnier in the surf (mostly small east coast waves in the spring/summer for me...). I weigh 140# so it should be plenty of volume for me and maybe (along with being long and skinny) make it easier to paddle into really small waves (the Allwave catches them pretty well anyway). I'm excited to try it out. You're gonna be stoked! Every new board takes some time to get used to but at your size i think you are gonna be loving it. I saw that it is sold. I was thinking about it, but I think it was too narrow for me. Give us a review when you get it! I am over 200lbs and have this board. it is not a log to stand on by any means. if you are looking for a board to be lazy on between waves and just cruise this is not the board. when i bust it out it takes me a few minutes to get used to it especially if there is any side chop. as for agility wow! my smallest board is 29 wide, the 27" makes it turn on a dime and it is fast! it works in small waves, but i prefer shoulder and up for my size, make sure to step on the tail and it just goes where you point it. bottom line, if you are my size it is not a relaxing cruiser, but rather a high performance board. i use it only 5-10% of the time, my b-line is my daily go to board and if i had the cash i would look at the 10' x 32" or 33". The New Deal came today. I live in Tennessee so it will probably be at least a couple of months before I get to try it out. I took it out for a paddle on flat water today and it felt plenty stable (on flat water anyway...) and tracks great compared to any other "surf" SUPs i've paddled. I went 2 miles in about 28 minutes without working very hard so if I can't surf it then at least I'll have a (slow and expensive) flat water cruiser. Congratulations! That is an impressive Tennessee quiver! looks skinny! Like a really short race board. That board looks plain awesome to my eyes. I took out my custom Pearson Arrow Laird 9'0 x 28 3/4 squash tail today for the 1st time in 6 months and had a total blast. I "reverse converted" to prone longboarding about a year ago. 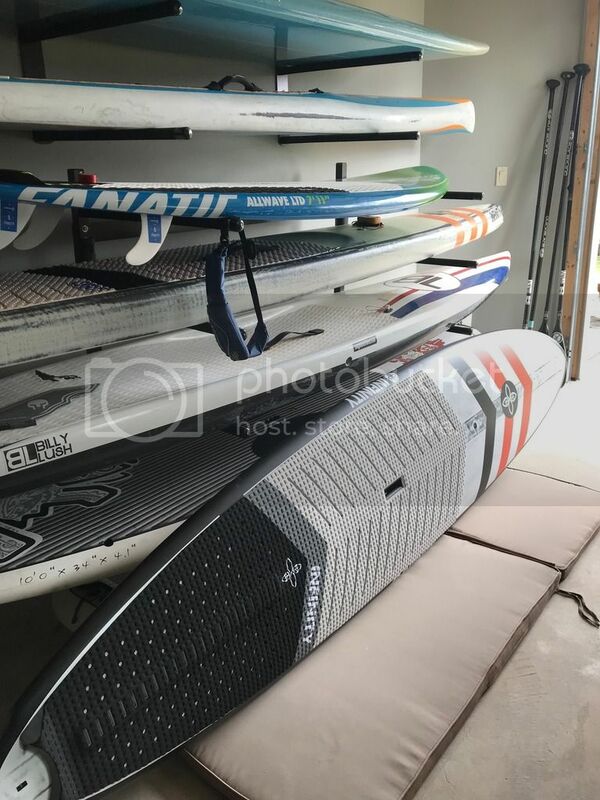 A narrow 10'0 is IMO ideal for a SUP. I had the Surftech Laird 10'0 x28.5, but I hated the lifeless Tuflite feel. It was heavy too and paddled like a dog. Congrats on the New Deal. You'll be "king of the beach" for sure! Great score. Sounds like you will make the adjustments necessary. They are sooo light and bomber!